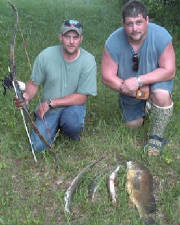 LBR and Dan Campbell after a successful Bowfishing trip. 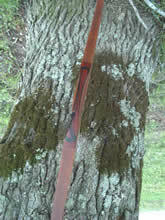 Dan shoots a Falcon Special (he has 3 of them). LBR hit the big Drum and Dan tapped the little Drum Sticks (Gars). 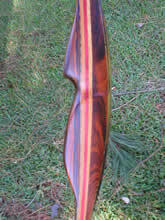 LBR dead centers this 'ray way out in the ocean blue with prototype 3-piece td longbow Marc made that never went into production. Clint V. from FL, LBR's most gracious host. 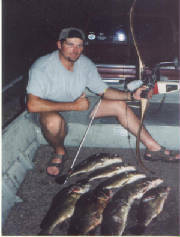 Although Clint shoots a Chek-Mate, he said his was "too nice to take bowfishing!" so he isn't holding one in the pictures. 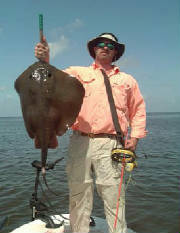 He is holding a very nice Stingray. 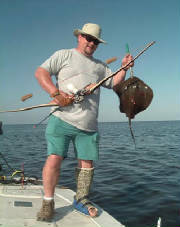 Dan shows off his bow fishing skill.